Cisco Systems has a stock and dividend history that's worth understanding for investors. Cisco Systems' (NASDAQ:CSCO) stock and dividend history has seen the networking giant go from being the most valuable company in the world at the height of the dot-com era to losing a massive amount of its valuation when the bubble burst and subsequently seeking ways to diversify its business and appeal to investors. Cisco was founded in 1984 and issued its initial public offering on Feb. 13, 1990, with its 24% share price gain on opening day kicking off a long run of appreciation. The company built a dominant business around router and switch hardware for network connectivity, and saw explosive sales and earnings growth as the internet revolution took hold. Its dominance in enterprise networking hardware propelled stock gains, and Cisco crushed the market across the span of a decade. 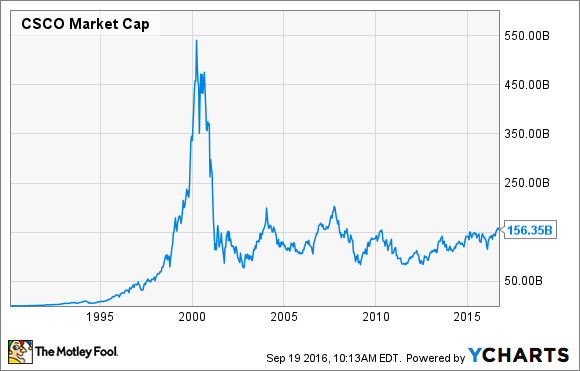 At its peak in 2000, Cisco stock traded above $79 a share, for a market cap of $546 billion -- surpassing Microsoft as the world's most valuable company and inspiring estimates that it could surpass a $1 trillion valuation. Unfortunately, the runaway success was not to last. The networking industry had, for all intents and purposes, never before experienced a steep downturn, and unchecked optimism about the growth of the internet prompted the company to ramp up production and expectations to unreasonable levels. This excess exuberance later translated into a $2.25 billion inventory writedown in 2001, when the dot-com bubble deflated. CSCO Market Cap data by YCharts. Shares gradually recovered and hit a post-dot-com-bubble peak in September 2007, trading above $33 and corresponding to a market cap of roughly $202 billion. These gains were erased in the 2007-2009 economic crisis, and shares traded in the $14 range at the worst point of the recession before recovering to roughly $24 at the end of 2009. Cisco announced its first dividend payment in March 2011 -- a quarterly distribution of $0.06 a share. The initiation of dividend payments came as Cisco's stock languished and its market cap dipped to recession-era levels. Underperformance for new business initiatives and the strengthening of competitors Juniper Networks, Hewlett-Packard, and Huawei at both high and low ends of the networking hardware market painted a challenging picture for Cisco, likely pushing it to return income in order to make its stock more attractive to the average investor. At the time of the announcement, the company's stock yielded 1.4%. Cisco has raised its dividend in each of the subsequent years, boosting it by a total of 333% since its inauguration. That equates to an average annual growth rate of 35%. The company's most recent increase came in April, a 24% boost. Cisco's dividend payout currently represents roughly 47% of earnings, and its 3.4% yield is one of the highest among blue-chip tech stocks. Over the last five years, Cisco stock has gained 88%, while the S&P 500 index has risen 77% and the Dow Jones Industrial Average has grown 59%. Over the last year, Cisco stock has gained 22%, compared to 11% and 10% for the S&P and the Dow, respectively. On the basis of total return price (i.e., including dividends) over the last five years, Cisco is up 116%. Today, the company is valued at roughly $155 billion and trades at roughly 13 times forward earnings projections. Cisco is still the leader in networking hardware, but competition for its router and switching business, and a trend toward emulating hardware functions with software pose long-term challenges. In the last fiscal year, roughly 39% of Cisco's sales came from its switching hardware, and roughly 20% of its sales came from routers. That level of dependence on hardware looks to be unsustainable. With long-term pressure on its core businesses, the company is focused on building strength in other segments, and sees growth opportunities with its collaboration business (which includes messaging services and video-conferencing hardware), enterprise security services (currently the company's fastest-growing segment), and software. The networking giant is investing in the Internet of Things and looking for the trend toward greater device connectivity to deliver a rising tide for its emerging business segments. While the company faces challenges associated with its ongoing reinvention, Cisco has strong financial and infrastructure resources, and looks to be in good position to weather changes in the tech sector and deliver wins for long-term investors.